Hello, my name is Barry from National Public Seating. Today we wanted to spend a few minutes talking to you about our stack chair line. National Public Seating offers one of the most extensive lines in terms of assortments of styles and colors in stack chairs, applicable to many different applications in terms of venue, and market penetration for our dealers. In front of me are the 9100 series, 9200 series, and 9300 series, each available in different color choices. Behind me are the brand new 9500 series, and to my left is the 9400 series and the 8600 series. Of course each series is represented by only one color choice, but today we're going to spend a few minutes talking about the unique specifications and designs of each individual product, where some of the chairs apply to in terms of market penetration and venue, in terms of the institutional market and what type of facility they belong in, as well as why these are the best value for stack chairs available in the marketplace. When one combines the top of the line specifications as well as quick ship availability and fair pricing, as well as an assortment of in-stock color choices, one recognizes the unique value of the National Public Seating stack chair line. Sometimes they are referred too as banquet stack chairs because of course all of these styles can be used in banquet facilities or food service environments, as well as the hospitality market. We sell, probably the number one best seller, is the 9200 series. With a dome back style, this happens to be the pleasant burgundy vinyl on the silver frame. With a dome back, that will probably be the most popular in the institutional and educational marketplace. For the basic board room, or teachers lounge, or really multi-purpose chair is your 9100 series. This happens to be a black frame on a black vinyl, or as we call it, our panther black vinyl. This is our price list that I have in my hand, listing all the different color options. And this is our top of the line banquet stack chair with what we call our silhouette back, often referred too as a crown style back and this happens to be built on the patterned burgundy fabric. All of the fabrics in this series are Teflon-treated for stain protection, and now we're going to talk a little bit about some of the features of them. I'm going to take the 9300 series just as an example. You've got an 18 gauge frame, you've got a rear brace which we call an H brace, providing support to the legs of the frame, and you've got an under-the-seat brace which provides strength when you're sitting on the chair, even though the core of the seat is plywood. So you have a plywood core with an under-the-seat brace and an H brace and side stacked bars with bumpers. Your glides are self-leveling glides, again this happens to be on the silver vein frame, you've got concealed hardware on the back for your upscale look, and you've got french seam, double-stitch type fabric. Again, in stock with 48 hour quick ship in a multitude of color choices. Just to give you an idea of what some of the color choices are, and you've got the same exact framing system on the dome back 9200 series, just a dome back instead of a silhouette back. In the 9200 series you've got a french beige vinyl on a mocha frame and you've got a midnight blue vinyl and a pleasant burgundy vinyl available either on a silver vein such as you see here or a black sand text frame. One of the most popular color frames we offer, the black sand text. Then in the fabrics, you've got a midnight blue, you've got a rich maroon, and you've got a diamond navy, a diamond burgundy, and they're available on a silver vein or a black sand text frame. All of these chairs can ship either boxed at a class 150, on a pallet, or we offer unique service to our customers that has a special non-boxed system for those customers looking for a lower class shipping. It brings it down to a class 85 and you can get 40 on a pallet instead of 32. A good way to bring shipping costs down. Ask your sales rep when you are looking for quotations on those opportunities. Often, that makes the difference in winning the business in terms of being able to provide a competitive freight quote from our freight quote department. Freight quotes at nationalpublicseating.com, if you email that email address they'll provide a quote to you within an hour or two in most cases, or less, and if you ask for the non-boxed option, you'll see the difference. We palletize it and wrap it very well for shipment so it doesn't get damaged but yet we save on the cost of the boxes by encapsulating the pallet with cardboard and shrink wrap by eliminating all the individual boxes depending on whether your customer desires the boxes or not. The 9100 series which is available only in vinyl in a pleasant burgundy and black panther on a black frame, still has the rear H brace and the under the seat bar. Here you have rocker glides just like you have rocker glides on the 9200 series, and stack bumpers but no, this is your basic value chair no side stack bars. So that's your basic 9100, 9200, 9300 series. New for this year is the 9500 series, let me just pull these chairs aside. And behind me are the 9500 series. The 9500 series is very popular in the worship market and/or the hospitality market. You've got a teardrop design on the back of the chair with a contoured seat cushion, available either on a chrome frame or on a gold frame, as you can see on this chair. These have self-leveling metal glides and all of the unique features that we described before. So just concealed hardware on the back of the chair, you've got all your side stack bars, and support bracing. And this is available in 3 popular fabric choices in a special pin dot fabric series. And again the fabric of course has treatment for stain protection. You've got the mocha cream dot, you've got the, which is this chair here with a gold frame, this is your sangria dot on a chrome frame, and then you've got your classic gold dot and this happens to be on a chrome frame as well. A new chair announced just in the last year becoming very popular particularly in the hospitality market. All of these chairs have a number of dolly options for transport and storage, we've got our DY9000, which is a dolly that allows you to pick up the chairs and roll it around, we've got our model DY81 which is your flat dolly which stores up to 8-10 chairs high and allows it to roll on four casters. Lastly I wanted to mention the 9400 series, this happens to be the 9400 series with arms, it's available with or without arms. This is on your patterned burgundy fabric, it's also available in a number of other fabric choices all on a silver vein frame with or without arms. A special feature on this chair unique to the National Public Seating 9400 series is the plastic arm rest, designed so that it won't crack or break over time. And the last chair being the 8600 series which we call our signature stack chair, a sled base stack chair on a chrome frame as well as available in a multitude of fabric colors. Most popular for your conference room type environment, typically paired up with our BT1800 seminar-style blow-molded folding tables. So these are just a few words about the National Public Seating stack chair line. Again, as mentioned in the beginning, they are 48 hour quick ship, you've got a multitude of options for all types of applications in the institutional environment. For any questions or pricing availability questions, simply contact a regional sales manager or feel free to send me an email directly to [email protected] and I'll be glad to respond to any questions you may have. Thank you for your time today. Check out Barry from National Public Seating as he provides some detailed information about several different styles of banquet chairs, including the 9100, 9200, 9300, 9400, 9500, and 8600 series. 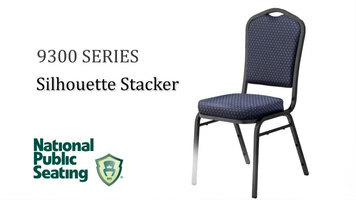 Ensure your banquet facility is equipped with the finest seating around with these NPS 9300 silhouette stacking chairs! Available in a wide variety of fabrics and vinyls, these stacking chairs add class and sophistication to any establishment. 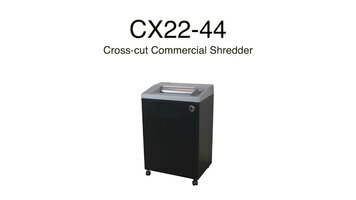 Get even your toughest shredding needs taken care of in your office with the help of the Swingline CX22-44 shredder! 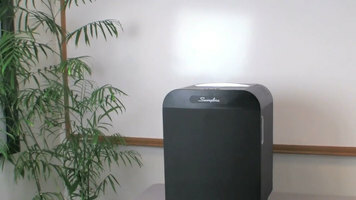 This machine shreds your paper into 332 small pieces so your personal information is properly destroyed before you throw it away. Choose the Swingline strip-cut shredder to make sure you have a machine that is up to the toughest tasks. Able to shred 22 sheets at a time, CDs, and credit cards, you can be sure your sensitive information will be properly taken care of with this machine.